With this toast the spiritual guide G. I. Gurdjieff (1866–1949) might welcome a newcomer to his circle of seekers. While Gurdjieff has passed away, his legacy endures in groups that seek to follow the precepts he offered for those on the path to deeper knowledge of themselves and the divine. 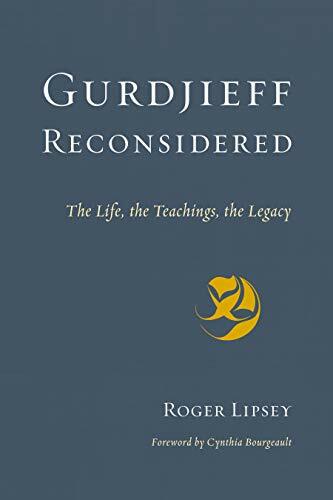 The richness of Gurdjieff’s legacy makes Roger Lipsey’s Gurdjieff Reconsidered: The Life, the Teachings, the Legacy an especially welcome probing of Gurdjieff’s life and teachings. The word “Reconsidered” in the title resonates in many directions. There were those who dismissed Gurdjieff’s approach and deprecated Gurdjieff himself. At the least, Lipsey sets out to both explain and counter such critics. Inevitably, to understand the critics, there must be an explanation of what they criticized. That explanation is extremely informative for the many who know nothing of Gurdjieff or have only the faintest inklings about him. For this audience the title might well be Gurdjieff Considered. Gurdjieff describes the challenge: “Our starting point is that man does not know himself, that he . . . is not what he can and what he should be.” Gurdjieff gave his opus, Beelzebub’s Tales to his Grandson, the subtitle An Objectively Impartial Criticism of the Life of Man. Drawing on the many firsthand accounts by followers of Gurdjieff as well as the author’s own decades-long commitment to The Work (the name given to the seeker’s engagement in the processes of Gurdjieff’s teaching), Lipsey describes the remarkable arc of Gurdjieff’s life. Born to Greek parents in Turkestan, he traveled widely in the east as a young man. Talented as both a composer and dancer, he immersed himself in the sacred dances and music that he encountered in religious centers. Lipsey believes Gurdjieff “could legitimately have presented himself as a representative of any one of three traditions—Orthodox Christianity, Sufism, and Tibetan Buddhism”—had he sought ordination by the appropriate authorities. Having settled by 1912 as a teacher in Moscow and St. Petersburg, he was forced by the Russian Revolution to move westward to Paris, a slow journey that took from 1917–1922. Always gathering seekers, followers, helpers, relatives, and others drawn to his teaching and magnetism, he established the Institute for the Harmonious Development of Man in a lovely and commodious chateau, the Prieuré des Basses Loges, about an hour from Paris in Fontainebleau-Avon. Especially key in awakening and uniting the mind, body, and feeling were the Movements, choreography and music inspired by Gurdjieff’s witnessing sacred rituals in the east. Aided in the music by the superb composer Thomas de Hartman, Gurdjieff as dance master rehearsed his devoted students in the Prieuré Study Hall which was large enough for three or four rows of six men and women each to practice complex movements with the accompaniment of a pianist. Demonstrations of the Movements took place in Paris in 1923–24. These performances in the service of awakening offered a target for journalists wishing to savage Gurdjieff as strange and pretentious. The upshot was that The Work, including the Movements, went underground. The Work continued, those drawn to seek it could find it, but public demonstrations would be rare indeed (today the Movements can be searched for and seen on the Internet with the caveat that the quality and authenticity of the performances will vary). What is profound about the Movements is the way in which such a focus draws together the three energies. However, Gurdjieff offered much more of which one small but telling example will be given. For people to be awake, they could not worship idols. Such idols might take the form of powerful people before whom others felt their identify slip away. Or social rules that people feared to violate. During Prohibition, Gurdjieff arrived in New York City with a bottle of Armagnac (his favorite brandy) visible in his coat pocket. Despite protestations, he refused to hide the bottle and, upon questioning by people interested in his teaching, repeatedly scratched himself. A devoted follower who had protested the brandy also protested the scratching, to which Gurdjieff replied, “Fleas.” His point was to question unthinkingly accepted proprieties, to act the fool if it would bring insight to his follower about the “vanity” and “egoistic self-love” that he believed formed barriers to awakening at the psychic thresholds of so many. The Depression brought financial woes and Prieuré, with its 56 rooms and capacious Study Hall, had to be surrendered. Around this time Gurdjieff determined to focus on his writing and broke off relations with many who had been close to him, including Thomas de Hartman. Yet he continued to the end of his life to teach, live with a circle of the devoted close to him, and compose additions to the oeuvre of the Movements. Lipsey traces the continuation of The Work after the death of Gurdjieff. Never prizing publicity, able teachers offered seekers the opportunity to experience the Movements, the teachings, and the community which flowed from Gurdjieff. Gurdjieff Reconsidered includes the author’s goal of protecting Gurdjieff and those who continued his work from the misunderstandings and calumnies of critics. These critics fit well into two groups—those of the 1920s who know little of The Work and whose blasts lacked any real target and those of the 1950s and later who entered The Work as seekers but reacted against it and left. Reading will bring an overview of The Work to the reader, but it’s clear from this book that only entering The Work will allow an understanding of what The Work truly is. Any difficult path will have those who embark only to feel their choice was incorrect. That appears to be the case with the later critics, but instead of acknowledging The Work wasn’t right for them they blame it. Along with Lipsey’s thorough rebuttals of these critics, he points out there are now available extensive and accurate reports from followers of what occurred with Gurdjieff and in The Work. In fact, one of the delights of Gurdjieff Reconsidered is the mastery Lipsey demonstrates over the extensive literature from Beelzebub’s Tales to his Grandson to P. D. Ouspensky’s In Search of the Miraculous to the many excerpted from memoirs that give welcome detail about the lives and experiences of those who answered the call and made Gurdjieff and his teachings central to their lives. That this in-depth book can be called an overview is a testimony to the vastness of Gurdjieff’s influence and legacy. Dramatic, elegantly written and structured, Gurdjieff Reconsidered is a probing exploration of a man important not only to his time but also to ours. It takes a well-deserved place among the author’s other fine studies which include Hammarsköld: A Life and Make Peace Before the Sun Goes Down (about Thomas Merton).